LUXURY ABOUNDS! NEW RENOVATION! BEYOND COMPARE! BOTH VILLAS RENOVATED FLOOR TO CEILING!! Featuring State-of-the-Art Kitchen, two king bedroom suites. Private master bathroom suite! Hardwood floors in all areas except for bathrooms, which are travertine. Cherry cabinetry, plus large kitchen island with built-in cooktop, microwave drawer and wine and beverage refrigerator! Built-in double oven! 36 c.f. french-door refrigerator! Lighted cabinetry! Enclosed front-loading steam washer and dryer. Kitchen has a Keurig so bring your coffee pods. We also have a standard coffeemaker. Two master bedroom suites, each with a king bed with Stearns and Foster mattresses. Beds feature 800 thread-count sheets. Huge closets with built-in closet systems. Private bathrooms feature travertine floors and showers, double sinks. Both bedrooms have flat-screen televisions with internet apps with Netflix. Guest Bedroom has a DVD player. Bedrooms have charging stations for iPhones, iPads, etc. Living Room features a 47-inch LCD television with DVR and Blu-ray player. Dining room will seat 4. Custom draperies throughout the villa. The newly renovated first floor villa will sleep a maxiumum of four people!! The newly renovated third floor villa features a state-of-the-art kitchen with Bosch stainless steel appliances, custom cabinetry, a separate island with granite countertops. The large island also has a 36' cooktop. The 36 c.f. french-door refrigerator features an icemaker with built-in water dispenser. Built-in stainless oven/microwave combo, plus stainless steel dishwasher. Front-loading steam washer and dryer. The kitchen has a Keurig coffeemaker and a traditional coffeemaker. Bring your coffee pods! The two bedroom suites feature a king bed in the master and two queen beds in the guest bedroom. Two brand new queen mattresses (January, 2019). All the closets are outfitted with closet systems for maximum storage. The bathrooms have travertine floors and tiled showers. The Master bedroom has two sinks as well as a makeup area. Both bedrooms have wood flooring. Both bedrooms also have large flat-screen televisions, with a DVD player in the guest bedroom. Bedrooms have charging stations for iPhones, iPads, etc. The living room has a 47' flat-screen TV with DVR and DVD player with sound boost bar. There is a maximum of six people in this villa. Maximum of four adults. Both villas feature keyless entry system, so there are no more keys to carry!! 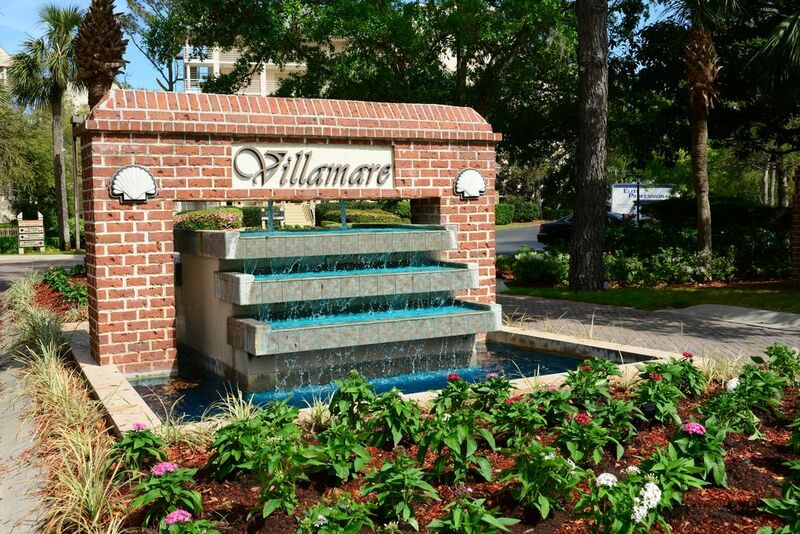 Villamare is a luxurious oceanfront complex located in Palmetto Dunes on one of the finest beaches in Hilton Head! Our villas are Oceanview and right on the Beach. Don't stay off the beach when you can be on it! Villamare is located right on the Ocean. No streets to cross. Both our villas are considered oceanview. Villamare is directly on the ocean. Perfectly clean, stocked and comfortable! This unit was prestige and beautiful! It was as clean as could be and every single thing felt brand new. The beds were comfortable, the kitchen was stocked with everything we needed. It was in a great location right on the beach, close to bike rentals and trails to ride. It was a great time and I would definitely stay here again! We loved the condo, just as advertised, the location and Karen was wonderful! We will definitely be back and stay here again! You know the babysitter that is a treasured gem and does everything that you could ever want a babysitter to do? Friends ask if you have a babysitter that they could use and you’re hesitant to share her contact info because you want her when you want her, and don’t want her schedule to fill up? That’s this place. Upon entering the grounds, you wind your way back toward the coast and you feel like you’re leaving reality and entering tranquility. The grounds are immaculate. The Christmas decorations were already up and they were spectacular. Before you pull into Villamarre, the bike and kayak rental facility is almost right across the street. Very convenient. Parking is under the building, and you’re steps away from the elevator, which has several luggage carts right next to it. Now on to the condo. Perfect. Gorgeous. Amazing topline appliances, stunning counter tops, beautifully decorated, cozy atmosphere. A smart use of space with the washer and dryer under a tall counter, behind cabinet doors. Fun, trendy bathroom sinks, pretty light fixtures, comfortable furniture. This place had a designer or someone with very good taste. The beds are extremely comfortable with soft linens. The outdoor pool is big and steps from the beach. We spent a lot of time in the outdoor hot tub since it was a little chilly. The indoor pool, sauna and hot tub were also great on cold, windy days. (But it closes at 5:00 and I wish it stayed open longer. Maybe it does in the summer). So if I had to give one criticism it would be that the kitchen ceiling is a little low. But I’m 6 feet tall, and I never felt claustrophobic. Just a little low. And it does get taller once you enter the living room space. Villamare is a great place to relax and vacation. Karen has this condo set up for anything you could think of. We loved the fact there were two king beds and plenty of room for the four of us. The properity is wonderfully maintained and this unit is close to the pool, beach, and grilling area. This was our first trip to Hilton Head and I think we picked the best place to stay. The owner is a great communicator and had the place loaded with anything you might need. The beds were really comfortable we have a Sleep Number at home and didn't miss it a bit. There is a nice little balcony with comfortable furniture to hang outside. If and when we go back to Hilton Head we will stay here again for sure. Good location, very nice and well decorated. First class inside and out. The owners spared no expense on the remodel. Bosch appliances, kraftmaid cabinates, etc. First time here...but not the last. Here's the best advice I can give you: stop spending hours researching for the best place to stay in Hilton Head in this price range....you have found it so contact Karen before someone else does and gets your time slot. This condo has all the comforts of home....plus more. I haven't slept as good as I did on the mattress in ages. As a matter of fact, my husband and I are on the hunt since we returned to get the exact same one: Sterns and Foster luxury firm. I love to cook and did so many times while we were there. Karen has made sure you have everything and I mean everything you need to prepare ANYTHING. Nothing cheap here-top of the line. Although I always bring my own spices for cooking, Karen has made sure to keep plenty stocked just in case you forget. *you have a good view of the ocean AND the pool. *this condo is located in Palmetto Dunes which is our favorite location since it is the closest to all of the shops and restaurants that we like. ( we have been coming to Hilton Head for over 18 years). *this condo is beautifully decorated and I actually picked up a couple of ideas to use at my own home. *Karen has thought of so many details to make your stay a relaxing and memorable vacation. *well appointed kitchen without a doubt. I wouldn't hesitate to rent any condo Karen owns. I'm not certain, but I think she might have a degree in hospitality or maybe she has worked in the hospitality industry since she knows what her renters want and need for a great time. Rates are subject to change until reservation is confirmed. All amenities at Villamare are free to paying guests. If you are seeing a charge for this, you are not booking with an owner. There is $15 gate pass fee payable in the form of cash or check only to Palmetto Dunes when picking up your guest pass.